About Elizabeth N. Message Elizabeth N.
We enjoyed an excellent tour of 'The Davids' with Elizabeth. She was very knowledgeable, friendly, thoughtful and interesting. We have many fond memories of the tour and learnt so much. This tour provided by Elizabeth was exceptional. 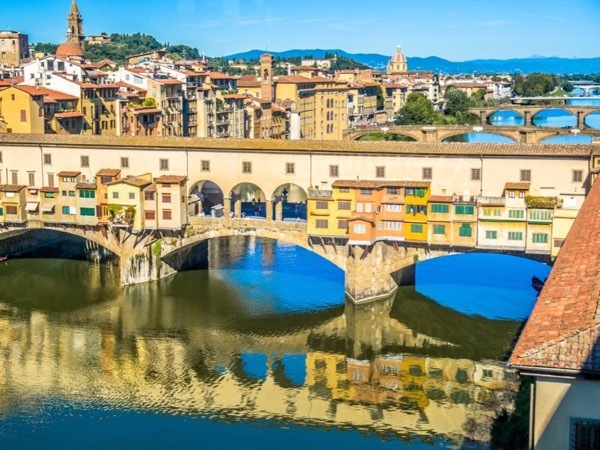 She shared her knowledge of Art History as we visited numerous sites within Florence. We now have a better appreciation of the works by various artists and the history of Florence. Tickets were obtained in advance in order for us to visit museums and churches with ease. She selected a typical local restaurant for lunch which was delicious. Having us picked up at the cruise port and return was seamless. We have great pictures from our outstanding day. TOUR GUIDE RESPONSE: Dear Anne, It was a pleasure to show Florence and its treasures and I hope to see you again. TOUR GUIDE RESPONSE: Ciao Heather! Thank you sincerely for taking the time to send in a review. I think our visit could be called the 'Fabulous churches of Florence' and I am glad I was able to show you some hidden gems in the understated Oltrarno area of the city. Enjoy the rest of your visit exploring Florence. We enjoyed our tour with Elizabeth very much! She was both informative and entertaining. I would highly recommend her to anyone. My two teenage daughters appreciated the Uffizi museum as much as I did. That was because of Elizabeth. She made the art on the walls relatable with her knowledge. When in Florence again, I will request Elizabeth. TOUR GUIDE RESPONSE: Thanks for the kind words Wendy and I sincerely hope to see you again. Next time we will tackle the Palazzo Pitti! Elizabeth was great! She let us customize our tour and got us in and out of museums with efficiency. We wanted to see everything. She was very knowledgeable about art and the museums. Leonardo the driver was also wonderful and spoke perfect English. We could not have had a better experience. I imagine it will be the highlight of our first trip to Europe, although we still have a week to go. Because she is dual citizen US and Italy, she related very well with us but also could take us untouristy places. Elizabeth was a really great guide - she tailored the tour to our interests and time limitations, and also provided us with some great tips on where to eat at the end of our Florence city tour. She is personable, funny and deeply knowledgable about the local architecture and renaissance art, having studied the subject at length, as well as how to restore ancient art works. Highly recommended. TOUR GUIDE RESPONSE: Ciao Eric, Enjoy the rest of your trip and I am glad you enjoyed the day! Excellent tour guide. Very knowledgeable and friendly. Wish we had more time with her actually. A delightful person! TOUR GUIDE RESPONSE: Thank you Ross for your kind words and all the best to the family. It was a pleasure to share the Medici's legacy of art and architecture with you!